The only reason I was hesitant to commit to cutting out soft plastics was cheese. 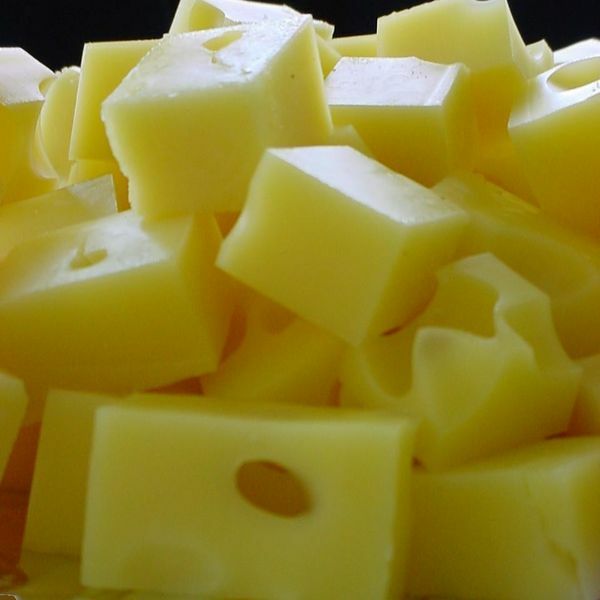 I love cheese: the two of us buy extra large, family size packages of aged white cheddar. Often when we think “there’s no food on the house”, it turns out the only thing we’re missing is cheese. Unfortunately, this culinary wonder (am I going too far?) invariably comes wrapped in cling film of plastic of some sort. And so, this week we underwent (cue deep, reverberating voice) “the quest for cheese”. Actually, it wasn’t so bad. I was pretty sure we could get someone to put a block straight into my container at a small deli, but we were aiming for the major grocery stores since that’s where the majority of Canadians shop. The first attempt garnered us blank stares and head shakes, but at the second store, after a bit of haggling and convincing (“I’ll take whatever kind of cheese you have. Yes, whatever you’ll give me. Yes, in this container. No, all by itself.”), we managed to purchase one of the most expensive blocks of cheddar cheese I have ever had. Contrary to the experience of Mrs. Green from My Zero Waste, our block of cheese cost twice as much as we would usually pay for it! Nevertheless, it was lovely cheese, and it’s good to know that even a major chain grocery store is willing to forgo packaging if you just ask. It’s funny how, before we started this project, I wouldn’t have given a second thought to the plastic wrapping around my fromage. It seemed like an intrinsic part of the product. I had never considered that is was an option to just ask for it without the packaging. And then there are advocates of an alternative approach. Some people suggest that if the item you want comes in a package, simply leave the packaging at the checkout of the store. The theory here is that if enough people force retailers to be responsible for their waste, they will pressure the manufacturers to use less packaging. In some places, like Britain, governments are stepping in and actual have laws against excessive packaging. A local example of this is London Drugs (large Canadian drug store chain) who has managed to reduce it’s waste by 40% and recently announced it will take back “all packaging associated with goods sold at and transported to stores” for recycling. Can you believe I just used the word package/packaging 6 times in 8 sentences? I’m still stuck with the tofu issue. . . . also always seems to be wrapped in plastic, i’m going to go wander around chinatown this week in hopes of finding some sans plastic wrap/container! I agree. Maybe the posting should have been “quest for tofu”. We’ve all been tofu-less for the past two weeks. But now that we have the cheese issue out of the way.. . . I heard that Sunrise Tofu might sell in bulk from their warehouse. Let me know what you find! Do you have time to make tofu, righttrash and rhy? A friend of mine makes it and it’s so good compared to the shop bought stuff. It’s virtually a zero waste product too, once you’ve dispatched the polythene that raw soya beans come in. Fortunately, we can recycled polythene in the UK. but I still think we can avoid them all together. I’m sure we can find soy beans in a bulk bin somewhere. Jan made soy milk beofre and It wasn’t bad- I think we should try and make some ‘Fu. Me again! I’ve been wanting to ask what the reasons for not serving you cheese in your own box were? I’d love to know what they said. I thought we would have problems with this too, but we’ve found that some places will even put raw or cooked meat into boxes for dh. Dry oats. EWwwww; I mix dry oats into yogurt and that is delicious and filling. Served with fresh fruit it makes a great breakfast. The stores who refused to give us cheese in our own container had a system where they open a big block and package it into smaller pieces all at once. They didn’t want to open a new big one just for us. Most did agree, however, that if we happened to be there when they were dividing it up (at some unspecified time), we could get a piece. I like the quote too. . . . I will try to get to sunrise with a container in hand this weekend and scout out china town. . . as for making tofu i’d be into giving that a try and milk making too but time is always such an issue. . . the fall will be less hectic i think then tofu making might be in order 🙂 but if you give it a go before then jen i’ll definately have to get tips from you bc we all know how great i am in the kitchen! I’ve recently started making my own cheese, and it’s not as hard as I thought.